Four suspected members of the Basque separatist group Eta, including its leading bomb maker, have been arrested in France, Spanish officials say. The three men and a woman were detained in a raid in Cahors, near Toulouse. The group allegedly carried out a fatal bombing at Madrid airport in December, Spain's interior minister said. 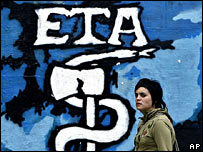 Eta has waged a violent campaign since the 1960s for an independent state in north Spain and south-west France and called off a 15-month truce in June. On 24 August, Eta members allegedly carried out their first attack since the ceasefire ended - a van explosion that injured two police officers in the town of Durango in Spain's Basque region. Saturday's joint French-Spanish raid took place on a house in a suburb of Cahors. Spanish Interior Minister Alfredo Perez Rubalcaba said the four were armed but put up no resistance. Mr Perez Rubalcaba said one of those held, Luis Ignacio Iruretagoyena, was the leading bomb making expert in Eta. The others were named as Ander Mugica Alaitz Aramendi, Alaitz Aramendi Jaunarena and Ohian Barandalla. Mr Perez Rubalcaba said the group was involved in the Madrid airport attack and a failed attack in Castellon, northern Spain, last weekend. "It's a very important operation... They were preparing a new car bomb," he said. Mr Perez Rubalcaba said the house in Cahors was an Eta "operational base". French police sources told Associated Press the four had been living in the house for a number of weeks and that handguns and bomb-making equipment had been found.